Hope, loss, understanding ageing, and the relationship between child and grandparent are the themes in this exquisitely illustrated book. Translated to English from Dutch by Australian author and award-winning translator, David Colmer, the fine line drawings and the soft and muted colours are reminiscent of the long ago classic tales of childhood. Maia was impatient to be born. It happened quickly under a cherry tree. Her first word was cake and her best friend was grandmother; an active, rebellious, playful and fun-loving free spirit. They had everything in common. They understood each other perfectly and there were times when words weren’t needed between them. When Grandma has a stroke, Maia doesn’t understand why she’s still. When she wakes up she doesn’t talk or remember anymore. When she can finally move, she has ‘grown slow’. 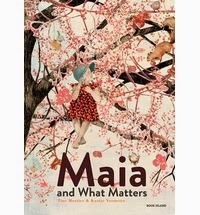 Maia fills Grandma’s surroundings with drawings of things she knows creating a familiar world of collage, hangs a thousand objects, and brings a plate with cake. When sounds came out of Grandma’s mouth, Grandpa just nods. But Maia ‘picks the words out of grandma’s mouth’. After Grandpa ‘had broken a teacup and stopped living’ Maia knew she had to wheel Grandma’s chair to the funeral parlour so she could touch his hair and said ‘bye’. A deeply moving story made so by the perfectly translated illustrations. The broken cup on the beautiful carpet and the back of an armchair tells of Grandpa’s passing; a child’s perception of a sea of tears cried portrayed by the literal presentation of a boat with Grandma and Maia in it rocking on stormy seas; grandpa in his cold coffin surrounded by frosty flowers and white crystals of air. But there is always a frisky squirrel appearing in some corner of the pictures which represents hope for the return of their lost freedom and love of the outdoors.